Please provide your brand, model, serial number, year, and horsepower. Outboard motor parts for Mercury, Chrysler, Force, OMC, Johnson, Evinrude, Suzuki, Honda, Nissan, Tohatsu, Yamaha, and MerCruiser I/O. Find a full line of CDI electronics for your outboard engine. We sell parts for outboard motors including gaskets, seals, bearings, CDI units, pistons, carburetor, reeds, rods, ignition parts, stators, carburetor kits, cooling parts, lower unit gears, water pumps, and impellers. 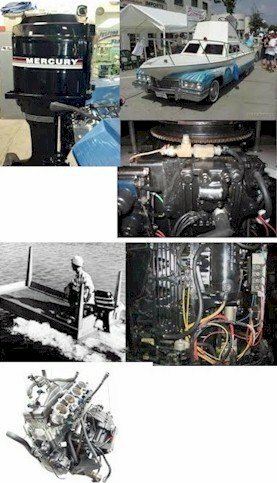 Our on-hand stock of outboard motor electrical includes trim and tilt, power packs, stators, coils, CD ignition, timer bases and rectifier/regulators. We stock watercraft parts for Kawasaki, Polaris, Yamaha and Sea-Doo. We carry pistons for Chrysler, Force, OMC, Johnson, Evinrude, Suzuki, Mercury, Tohatsu, Yamaha, and Force Outboard Motors. We also carry Pro-X pistons for Kawasaki, Mariner, Polaris, Kawasaki, and Sea-Doo Watercraft. We stock outboard motor trim / tilt units, trim pumps and starters that manufacturers no longer supply. Arco electronic parts include solenoids, trim and tilt units, trim / tilt and starters. We carry Boyesen reeds, carburetor kits, pistons, stators, CDI electronic ignitions, power packs, gaskets, seals,� bearings, cooling system parts,� rebuilt and new lower units and crankshafts for the above engines. As well, Outboardparts.com carries a full line of outboard motor steering & control cables, electrical connectors, fuel lines, hoses, and fuel tank fittings. We also offer lubricants, sealants and adhesives. Outboard motor repair links for older and vintage outboard motors. We carry outboard motor parts for some very unusual boats!! !